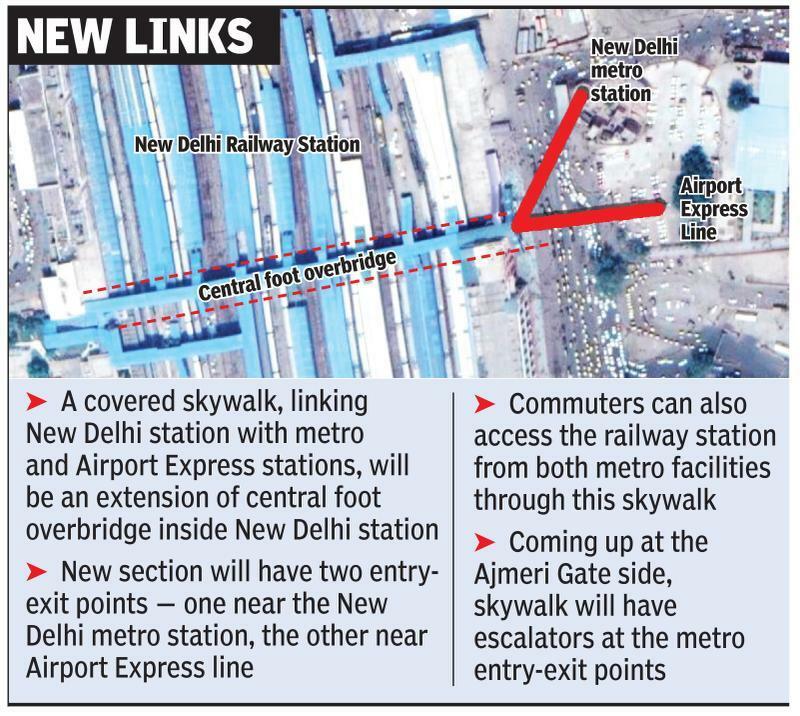 A new skywalk is going to be built in the National Capital that will offer a seamless connectivity to the commuters between New Delhi Railway Station and Metro stations. This new facility will bridge the distance by establishing a direct connection from New Delhi Railway Station to Delhi Metro’s station on the Yellow Line and the Airport Express Line. The skywalk is a part of the Northern Railways’ plan aimed at comprehensive improvement of Ajmeri Gate side of NDLS. The work is being carried out in coordination with DMRC and is expected to be completed in 6 months. Currently, the passengers from the metro and public buses have to walk through the road traffic in order to reach the station building. But the construction of the skywalk will resolve this problem by enabling smooth movement of the commuters. Besides, the entry load and circulating areas are being remodeled in order to handle huge rush of passengers which in turn would keep a check on the heavy congestion on the Ajmeri Gate side of the station. Moving on, the Northern Railways has planned a new direct entry road from Bhavbhuti Marg straight to the station. It will be constructed with green belts and footpaths on both sides of the road. Besides, the Railways will deploy Marshals to regulate the traffic and to keep a check on unauthorized parking in the surrounding area. This is expected to reduce the traffic congestion to a considerable extent. As per a Northern Railway Spokesperson, the entire area will be re-developed and fitted with efficient drainage, high-quality concrete roads, landscaping, fountains, and state-of-the-art LED signage. Also, there will be separate lanes for parking of taxis, autos, and buses. Lastly, an ample amount of space has been earmarked for the parking and pick-up & drop facility. Next articleUP govt cancels land given to Baba Ramdev for Rs 2000 crore food park?